Have some leftover pork roast and potatoes? Cut up and toss together for a hearty winter breakfast or tasty supper treat. For dinner, serve with crusty hard rolls and a fruit salad. 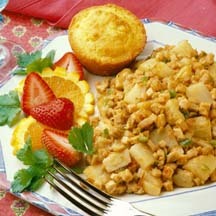 As part of a morning menu, serve with fresh fruit and muffins. Heat oil in large oven proof skillet over medium high heat. Cook pork 3 to 4 minutes, until slightly brown. Stir in potatoes, onion, green pepper, garlic, broth, thyme, salt and pepper, cover, lower heat and simmer for 8 to 10 minutes. Place skillet under broiler 4 to 5 inches from heat source. Broil until surface of hash is crisp and golden brown, about 2 minutes. Sprinkle with parsley.